Bleeding gums after a tooth extraction, dental implant or periodontal surgery can be very worrisome but it is to be expected after dental surgery. It’s important to identify and address excessive or abnormal bleeding and to contact your dentist or dental surgeon if you have any questions or concerns. Bleeding is usually the worst for the first 24 hours and can look much worse than it really is. When blood mixes with saliva, it looks like blood… lots of blood. Here are a few tips on how to stop the bleeding on your own. Apply a wet gauze compress to the gums – This can be accomplished by dampening a piece of gauze with water and then rolling it up or folding it into a square. Next, place the gauze on top of the empty tooth socket or other procedure site. Then bite down on the gauze to apply firm pressure for about 45 minutes to an hour. If you do not have gauze on hand, a wet, folded paper towel can be used instead. Bleeding should be significantly slowed or stopped after 60 minutes of pressure. Keep your head elevated above your heart – Bleeding can be slowed if blood pressure is lowered by propping your head up in bed with some pillows. Keeping your head higher than your heart can lower blood pressure. Bite on a black tea bag for 30 to 45 minutes – When using the tea bag method, it is important to make sure that the tea bag is wet and is black tea as black tea leaves have tannic acid which is a coagulant. This should help encourage the blood to clot more quickly. Rest – After periodontal surgery it is important to rest for a couple days following surgery. Avoid strenuous activity or exercise as this may activate more bleeding and prolonged healing. Be careful of what you eat and drink – There are many food items or drinks that can negatively impact the tooth extraction, dental implant or any oral surgical site. One of the most common mistakes that we see patients make is drinking through a straw. Do not drink from a straw for several days following a tooth extraction or periodontal surgery as this can dislodge the blood clot. Smoking also can dislodge the clot and spread harmful chemicals around the wound site contributing to painful infection called “Dry Socket”. Other things to avoid are hot beverages and carbonated beverages as these can dissolve the blood clot. It is important to stay away from crunchy or chewy foods as these may dislodge the blood clot. It is best to stick with soft foods such as warm (not hot) soups, applesauce, and smoothies following oral surgery. What Causes Bleeding After Dental Surgery? Bleeding disorders – Some patients have blood disorders such as Hemophilia which cause excessive bleeding. If a patient has a blood disorder, the post-surgical bleeding will take longer to stop and the surgical site will take longer to heal. Please notify your dentist prior to surgery if you have a known bleeding disorder. Past incidents of excessive bleeding – Prior to periodontal surgery, dental implants or wisdom tooth removal, we encourage our patients to think back on other times that that they may have had a tooth extracted or dealt with an oral trauma, a cut, or even a piercing. Did it take a long time to stop the bleeding? These past experiences may be an indicator to whether or not you will be dealing with prolonged or excessive bleeding after oral surgery. Medication – There are a number of medications that increase the risk of excessive bleeding. Some are very typical over the counter drugs such as Asprin and Ibuprofen. Others may be prescription drugs such as Warfarin, Plavix, Coumadin, Elaquis, or a number of other commonly prescribed blood thinners. Vitamins and Herbs – Some common vitamins and herbs such as Vitamin E or Ginkgo biloba can also significantly affect the bodies ability to form a blood clot. Bleeding following dental surgery is common however there are a few things that a patient can do beforehand to minimize post-surgical bleeding. Show your dentist your meds – We encourage all of our patients to bring in their regular medications prior to oral surgery so that we can discuss them and help our patients understand if their medications may increase the chance or amount of post-surgical bleeding. Even many common pain relief medications natural supplements and herbs can cause an increased risk of excessive bleeding. Avoid alcohol – Patients should also abstain from alcohol consumption for about 24 hours prior to surgery in order to help their body’s ability to clot blood and heal efficiently. The presence of alcohol in the blood slows platelet production and so blood does not clot as quickly as it naturally would. Don’t Swish Vigorously or Use Over-the-counter Mouth Rinses – While it may seem like you are keeping the dental surgery site clean or removing food and debris, you are actually removing the blood clot which has all of the growth factors necessary for healing. It’s also important to note that products such as Scope or Listerine inhibit healing of the surgical site and should be avoided until your dental or implant surgeon instructs you it is safe to resume. The key to feeling better quick is to take extra good care of yourself during those first few days post implant, tooth removal or other oral surgery. We recommend that you follow your own dentist’s post-op care instructions but below are some of our main guidelines to help patients experience a smooth recovery. Control Pain (swelling and stiffness) – Swelling and stiffness is common for about 7-10 days following oral surgery, however most patients feel much better after the first 24 hours. Slight bruising may also appear which is also normal. Discuss with your dentist or Periodontist about the best pain relief medication for you and take it as discussed. During your first 24 hours post oral surgery, we encourage our patients to rest with their head propped up with pillows. Patients should also use an ice pack on the outside of their cheeks in 15 minute increments throughout that first day of recovery to minimize discomfort and swelling. What to eat – Grocery shop a day or two before your tooth extraction or oral surgery. That way, it will be at your home and readily available for you when you want it. There are two things to consider when planning your meals ahead for after oral surgery. One is that your mouth will be sore and the other is that you do not want to disturb the procedure site. For these reasons, we suggest soft foods or liquids. This can be soups, smoothies, yogurts, pudding, protein shakes, mashed potatoes and ice cream. Vitamin C can also help your body heal more quickly so we suggest taking a supplement for a few days post surgery. Chose items that do not require much chewing as your jaw will likely feel stiff and a bit sore. The sucking motion can dislodge a blood clot and hamper healing. It is best to avoid crunchy foods for about six weeks after surgery. Salt water rinse – Keeping your mouth clean after getting dental implants or having your wisdom teeth extracted will help ward off infection. However, you should not brush your teeth until cleared to do so by your dentist so rinsing with salt water or a prescribed disinfectant mouth wash is important to do after that first 24 hour period is up. We recommend rinsing at least 4 times a day, especially after you eat. The salt water rinse mix can be made with a teaspoon of salt dissolved in a cup of warm water. Dr. Michael also recommends a prescription mouth rinse, Chlorhexadine, twice a day. Do not smoke or use straws – Basically, you want to stay away from sucking on anything as this can dislodge the blood clotting over the wound. If the blood clot breaks away, a patient can get a painful condition called dry socket. Dry Socket Symptoms – If the blood clot dislodges or dissolves, it can leave the nerves under the tooth socket exposed to food, liquid, air and any other element that may enter the mouth. This can cause a lot of pain and leaves the site wide open to infection. Typically if a patient has a dry socket, they will start feeling pain that radiates through their jaw within the first five days following surgery. No need to worry, call your dentist and they will get you in to place a medicated socket dressing in the extraction site. This will give almost immediate relief, however, the application usually needs to be repeated once or twice – about every other day until pain is gone and the blood clot has formed in the socket. Antibiotics may need to be prescribed for infection so call your dentist should you develop new pain after a couple days post surgery. Serious complications after tooth extractions and oral surgeries are rare but call your dentist if you experience symptoms that concern you. Always call your dentist if you develop a fever post surgery, experience excessive bleeding or swelling or have uncontrollable pain. We understand that patients do not look forward to oral surgery and want to heal up as quickly as possible. That should be any dental team’s goal too so if you have any questions about bleeding after getting dental implants, having your wisdom teeth removed, or any other periodontal surgery, please give your dentist a call right away! 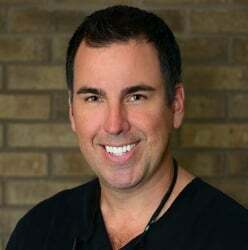 Hank D. Michael, DMD has been performing oral surgery, dental implants and teeth extractions since 2001. He is a fellow of the Misch International Implant Institute and a fellow of the International Congress of Oral Implantologists. If you are concerned you may be losing a tooth, or already have missing teeth, please call 941-929-7645 to schedule a consult today.